If you have never been to the island of Cyprus then you are truly missing out on a holiday that would remain indelible on your mind for years to come. Cyprus is located in the Mediterranean Sea close to Turkey. Cyprus is divided into six districts which include Famagusta, Larnaca, Limassol, Paphos and Nicosia. Here you can experience both old and modern day Cyprus at its best. Stone Age Cyprus is revisited with the presence of old buildings and archaeological evidence. 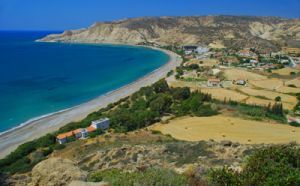 Tourists flock to Cyprus coastal area where its always tranquil and the beaches produce hours and hours of fun. The capital of Cyprus is Nicosia and this is the place with a rich history and of course a great city to meet friends. There are enough bars and restaurants in Cyprus if only to stop for a while to sample some of the islands Greek food which is a staple. The Cyprus population has mostly Greek but also Turkish a wide plain lies between two mountain ranges which rise to Mount Olympus (6,406ft), the island is rich in agricultural products, mainly wine, wheat, olives and tobacco. Excavations revealed neolithic culture existed between 4000 - 300 BC. Ancient Cyprus has been ruled my many cultures including Phoenicia, Egypt, Greece and Rome. Christianity was introduced by apostles Paul and Barnabas. During third crusade (1192) given to French Lusigvan dynasty, later ruled by Venetians and Turks. Placed under British administration (1878) Cyprus received colonial status (1925) Cyprus became a member of the British Commonwealth in 1961.